Pirates are considered to be criminals. They hijack ships for ransom and make a fortune. They do not have political objectives. However, in a recent article in the New York TimesJeffrey Gettleman reports that Somali pirates are indeed getting involved in politics and take sides in the civil war. If this holds true, it marks a new development in Somalian piracy. Pirates may just be about to change their face from profit-driven criminals seeking ransoms to conflict parties and political actors actively shaping the future of their country. 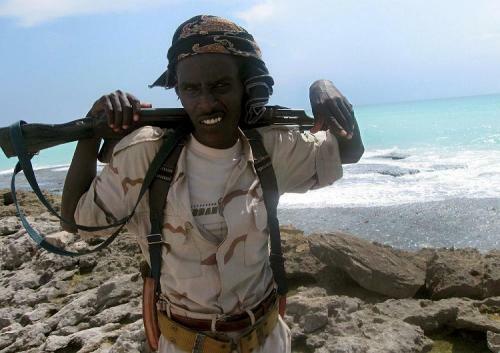 Until recently, pirates have sought to avoid taking sides in the Somali conflict. Their bases can be found in remote villages far away from the epicenters of the civil war. According to Gettleman, their objective is simple and clear: “We just want the money”. The western backed Transitional Federal Government, on the other hand, condemns piracy, as do its Islamic contenders. Fighting piracy, it seems, is one of the very view objectives that all conflict parties share. This, however, seems to be changing. As the war is getting even more intense, with hundreds of peoples killed in the last few months, both sides apparently forge alliances with pirates in order to strengthen their position. The TFG is in a desperate situation. Protected by troops from the African Union, it only controls a few road blocks in the capital Mogadishu, where it is besieged by Islamic forces. Nevertheless, also the Islamists are not doing well. Despite their military superiority, they have so far been unable to defeat the TFG. Moreover, they are increasingly losing support among the population. Both sides are thus in a dire need of new resources – money, weapons, fighters – and the pirates could just provide that. Since their surge in 2008, the pirates have changed. Their numbers are growing and they are getting more powerful and better organized. As millions of ransom dollars pour into their hands, some pirate leaders have reportedly set up large and well armed militias to defend their interests. In April, however, Hizbul Islam conquered Xaradhere, an infamous pirate port, and forced many pirates to withdraw. In Northeastern Somalia, the government of Puntland is reportedly increasing efforts to curb piracy. Meanwhile, on the sea international naval forces are making pirate operations more difficult. For pragmatic reasons, there may thus be an incentive for the pirates to get involved in politics and secure their profitable livelihoods. In Xaradhere, pirates have reportedly agreed to share ransom money with Hizbul Islam, a more moderate Islamic militia, in order to continue their profession. After all, piracy is about getting money, and it does not matter with whom you cooperate. Or is there more in pirate politics? “Sometimes (…) you commit crimes to defend your freedom”. This statement may just be propaganda. But it could also indicate a new area in Somalian piracy, an area where pirates take part in politics and shape the future of their country. It is still unclear where these new developments may lead to. However, Gettleman’s observations may have severe consequences. If pirates can no longer be evaluated as private, profit driven actors, is the current legal architecture equipped to address these? For the law of the sea piracy is a private affair, but how to prosecute pirates if the follow political aims and are conflict parties? The entanglement of pirates in the Somali Conflict might however well be an opportunity also. It opens the opportunity to negotiate with them, and also may widen the tool box by which they could be punished for their deeds. For the civil war in Somalia it will mean a little less hope. The new role of pirates and the resources for war-fighting they bring in will, without doubt exacerbate the conflict. However, with conflict dynamics changing and the pirates becoming stronger, they will emerge as powerful political actors. Pirates may take side in the civil war – on either or both sides – and play an important role in the struggle over power, peace and the future of Somalia. Perhaps, pirates have always been part of this struggle, and we have just not seen it. Source: Gettleman, Jeffrey. “In Somali Civil War, Both Sides Embrace Pirates“. New York Times, 1 September 2010. Available Online.